Above: Sundays were picnic days. Favourite spots were the Botanical Gardens and the Zoo. 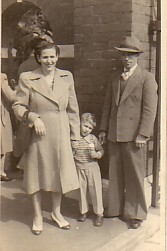 Ioannis, with his wife , Kleanthi (Pitsiladis) and their son, Doukas, outside the entrance of the Wellington Zoo. 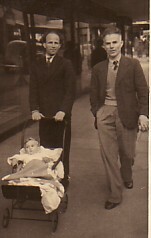 Above Right: Walking down Willis St, Wellington, with his son, Doukas, and Mr George (Mastrogeorgos). George was also from Plomari, who sponsored many Plomarites to New Zealand. Above: The Kontopos Family. 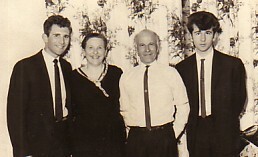 From left: son, Doukas; parents Kleanthi and Ioannis; and son, Tzanos. Photograph was taken at Doukas' 21st Birthday.